There are multiple artists named "Hurts" 1. Manchester, UK electro-pop duo Theo Hutchcraft and Adam Anderson. Formed in 2009, elegant and enigmatic HURTS have their sharp suits, slick hair and stark visuals. Theo and Adam present a striking contrast to the glow-in-the-dark pop stars who have run amok across the charts of late. Looking like they would rather be on the cover of Vogue Hommes than NME or Smash Hits, the pair resemble Tears for Fears as shot by Anton Corbijn. 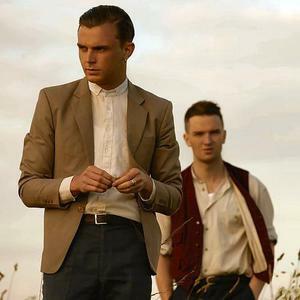 Hurts have recently released their first single "Better Than Love" and toured the UK and Europe during the summer of 2010. 1. Manchester, UK electro-pop duo Theo Hutchcraft and Adam Anderson. Formed in 2009, elegant and enigmatic HURTS have their sharp suits, slick hair and stark visuals. Theo and Adam present a striking contrast to the glow-in-the-dark pop stars who have run amok across the charts of late. Looking like they would rather be on the cover of Vogue Hommes than NME or Smash Hits, the pair resemble Tears for Fears as shot by Anton Corbijn. Hurts have recently released their first single "Better Than Love" and toured the UK and Europe during the summer of 2010. Before HURTS, singer Theo and synthesiser Adam were in bands Bureau and Daggers, the latter of which supported Gary Numan. However, on a trip to Italy, they discovered "disco-lento" (slow disco) and became fixed on a more austere, and stylish, European aesthetic and Hurts was born. Musically, they construct melancholic 1980s-inspired electro-pop with songs that they say are inspired by the British mentality of being "not too bad". "How are you doing? Not too bad. For a while you think that's not very interesting," Theo once said. "But it can be very interesting because it's on a knife-edge of hope and despair." 2. Hurts (????? )started out in 2006 as a session Japanese band limited to playing small lives in Nagoya. On 8/18 at the Wakayama UNDER CODE Special Event, KISAKI announced that he had added hurts to the lineup of Under Code Production. hurts disbanded in March 2008 .